Weight Loss by Hypnosis: Does it Work? Weight loss by hypnosis is an great way to begin your weight loss process. When using hypnosis, a person feels an awareness of deep relaxation and in this altered state of consciousness is very vulnerable to suggestions and propositions given as an attempt to improve negative behavior or practices. Hypnosis is recognized as a sound medical technique by the American Psychological Association and the American Medical Association. Weight loss by hypnosis has been shown to be an effective aid in the process of losing weight in many cases, according to the Journal of Clinical Psychology. As indicated by Jean Fain from Harvard Medical School psychotherapist, weight loss by hypnotherapy works. A variety of studies that have been done have indicated this to be true. It definitely makes complete sense - after all we basically always do what our subconscious mind suggests. Suggestions of eating much healthier, working out more and behavior modification can certainly be ingrained into the individual’s unconscious mind. The subconscious then embraces eating healthy foods. You will start to make healthier choices with great ease. There have been several clinical studies performed to determine whether hypnosis is effective in assisting people lose weight. 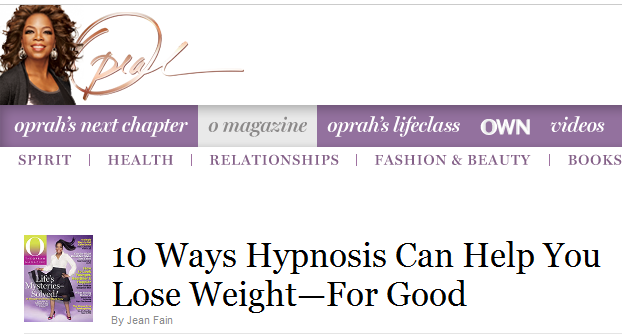 One study affected a group of 60 over weight females receiving hypnosis as a weight loss tool. The group dropped an average of 17 pounds each; while a control group lost just 0.5 pounds. In a different study, 109 people underwent behavioral therapy to manage weight problems, some with the addition of hypnosis. After 9 weeks, the study showed both groups were successful in reducing their weight, but follow-ups at 8 months and two years showed the hypnosis recipients continued to lose weight, while those who received behavioral therapy only registered little change. In the 1990’s, eighteen hypnotic scientific studies revealed that psychotherapy clients who learned self-hypnosis dropped two times as much weight as those who did not (and, in one scientific study, kept it off couple years after treatment stopped), hypnotherapy has remained a well-kept weight loss secret. Most people wanting to drop weight record that they have specific issues that they struggle with specific foods. For example, many dieters say that they have trouble with sweets, while others say their difficulties lie with salty or crunchy food items. Those on a diet often report that particular times of the day are an problem for them. In cases wherein eating patterns and habits are the cause of weight problems, hypnosis can help to recalibrate eating patterns. Most people wanting to drop weight record that they have specific issues that they struggle with specific foods. For example, many dieters say that they have trouble with sweets, while others say their difficulties lie with salty or crunchy food items. Those on a diet often report that particular times of the day are an problem for them. In cases wherein eating patterns and habits are the cause of weight problems, hypnosis can help to re-calibrate eating patterns. By using hypnosis to lose weight, you are reprogramming your mind. By some estimates it takes 21 to 30 days of constant reprogramming to achieve long-term change. Listen to an appropriate hypnosis session at least once every day for that period of time. The more repetition the better. If you are seeking a hypnotherapist to help you, the most important factor is rapport. If you believe that a person has the ability to help you, she most likely can. If you don't like the person or trust her or her skills, hypnosis will almost certainly have no effect at all. Healthy food in moderation is the way to go. Maximizing the motivation to eat well. Encouraging you to eat often, usually six small meals per day. Encouraging an increase in fat-burning metabolism. Encouraging exercise by instilling a sense of restlessness at certain time a day to signal activity is needed. Envisioning seeing yourself in a fat suit and what it's going to be like to feel so relieved to begin to discard one layer at a time revealing your new body. Suggesting, that you don't mainly focus on weight, but rather on fitness and health. Distinguishing between poor food choices (processed carbs, sugars, chemically altered stuff) and good food choices. Using a hypnotic journey metaphor and suggesting that at each stage of the journey, you can notice how the pressure on your feet feels lighter, how your body feels better, what clothes you are now wearing. Using disassociation to enable you to see yourself in the future looking slimmer, eating well, and exercising in the right ways. So as you can see there is strong evidence that weight loss by hypnosis is an effective tool for weight loss management. To learn more click here or here.